After introducing you to Linn’s DS range of music players in last month’s blog posts, we’re now turning our attention to the DSM range. Today, we’ll be looking at the Linn Magik DSM which, unlike its DS cousins, brings you the best of both worlds – music AND movies. The Linn Magik DSM is a sound superhero as it has the power to handle almost any challenge you set it. Hook it up to your DVD player, digital TV, satellite TV, Blu-Ray player or games console, and it’ll be obvious within seconds that the soundtracks, special effects, and action sequences are far superior to whatever you’ve experienced before. You can also connect the system to your smartphone, tablet or laptop to browse and stream audio files and playlists in unrivalled studio quality. 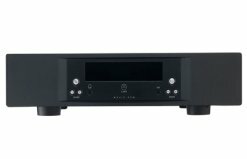 The Linn Magik DSM comes with four HDMI outputs and one HDMI input that allow you to connect the player to external sources, and benefit from the superior DAC (Digital to Analogue Converter) and custom Linn up-sampling. The system’s other inputs enable you to connect to sources with Spdif (RCA) and Toslink (optical) digital outputs. Plus, there are Spdif and Toslink outputs that let you link to an external DAC or computer. Another benefit you’ll get as a Linn Magik DSM owner is the removal of unwanted distortion caused by your listening environment. This is thanks to the player’s built-in Space Optimisation technology, which uses sophisticated acoustic modelling to build up a complete picture of how the unique characteristics of your room, your loudspeakers, and their placement interact. Space Optimisation takes this information and uses it to reduce the energies of frequencies that are artificially distorted by the environment, giving you a powerful, untainted, and uniquely optimised audio performance. The Magik DSM’s fully integrated pre-amp and power amp mean that the only accessories you’ll require immediately are a pair of speakers. As the first-class audio technology used in the DSM range deserves to be paired with exceptional loudspeakers, we recommend that you consider purchasing the 109, 112, 126, 140 or Isobarik models in the Majik range. Alternatively, you can purchase a complete system, which consists of the Linn Magik DSM and Majik 109 Loudspeakers, and you’ll be all set for a lifetime of memorable music and movie performances. Our purpose-built Linn Lounges at our Essex and London stores allow you to sample the superb quality of Linn’s DSM players while our expert team advise you on how to create or set up the perfect system for your needs. Demonstrations can be booked via phone (Essex: 01277 890 888 or London: 020 7454 1234) or online contact form between the hours of 9am and 9pm Mon-Fri and 9am and 6pm Sat-Sun. Rococo Systems also offer our customers the opportunity to trade-in their existing audio equipment and save money on upgrading to Linn’s DSM range. To find out more about this unique opportunity, please visit our Trade-In page or call us on the phone numbers given above to discuss your options.